Worst bit: This book is more Anglican than it thinks it is 😉 Although this material is designed to be used by anyone wanting to provide real worship for young children, it does lend itself very well to an Anglican church, for example the building blocks map neatly onto the building blocks of a liturgical service and there are some brilliant explanations and actions to go with various words said in a Book of Common Prayer Service. Saying this, I don’t go to an Anglican church and I’d happily use it. The inside of this book is black and white, with lots of text. I’d’ve liked more symbols and pictures, but then I’m a visual learner. 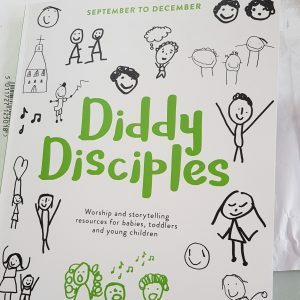 Useful for: Anyone wanting to take young children’s faith and worship seriously. The material is aimed at groups but could easily be used at home too. My first thought about this book was that it’s BIG! I had seen the price and wondered. However, there is SO much in this book (over 260 pages) with material for a whole term of weekly sessions, although of course you can easily use it to dip into at any time and it could last a long time (saying that, I’m looking forward to the next one which will have Easter in it!). There’s a lot of thought, experience and wisdom gone into the making of this material, which makes something quite difficult (involving very young children in worship) seem very accessible. apparent as the ideas are explained simply and seem very easy to adopt. I definitely recommend it to anyone wanting to make a space for young children to worship as part of an adult service, in their own group or even at home together.